Anyone who has experienced jet lag knows the power of the biological clock. Almost all organisms, from humans to the smallest of bacteria, have a built-in system that tells them whether it is time to rest or to be active. Most biological clocks 'tick' autonomously, but some bacteria depend on light to synchronize their clock every day. 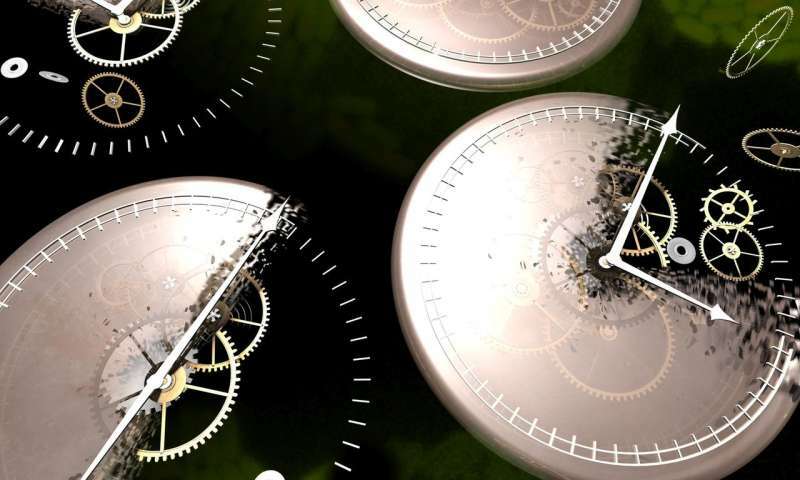 Using mathematical calculations, researchers from AMOLF and the University of Michigan have now demonstrated that an autonomous clock suffers far less from noise, such as fluctuations in sunlight due to clouds. The research results were published online on August 14th, 2018, in the scientific journal Physical Review Letters. Virtually all organisms have a day-night rhythm, by which they eat and sleep at fixed moments of the day, for example. This rhythm is dictated by the protein concentrations in the organism's cells that oscillate over a period of 24 hours. These comprise the circadian clock. In most species, the circadian clock does not depend on external signals like light and darkness. "If you were to confine people or animals in a room without light, then they would still have a need for sleep or food in a rhythm of around 24 hours. Nevertheless, our biological clock is sensitive to light and darkness," says Pieter Rein ten Wolde, who leads the group Biochemical Networks at AMOLF. "The period of about 24 hours is set, but the phases can shift. If we travel to the other side of the world, then we need time to adjust—this is the well-known phenomenon of jet lag. However, we quickly pick up the shifted day-night rhythm of the new environment." Some bacteria, however, have what biologists refer to as an hourglass clock. These clocks need to be reset by light every day. If that does not happen, then the clock stops ticking. Ten Wolde: "Such hourglass clocks are found in certain types of cyanobacteria, the blue algae that are now polluting swimming water at many locations. Other cyanobacteria species do have an autonomous biological clock, though. With the help of mathematical models, we have investigated what the advantage of autonomous circadian clocks is." The researchers discovered that the effect of noise differs for the two types of clock. For a biological clock, variations in the intensity of sunlight due to clouds, for example, are an important source of noise. "We discovered that autonomous clocks are far less sensitive to such noise," says Ten Wolde. "We can model an hourglass clock as a pendulum. As long as an external signal drives it, it remains in motion. A strong driving mechanism ensures oscillations of a large amplitude and therefore a better time indication. In the case of a strong coupling, however, small changes in the input signal are also amplified, which makes it harder to tell the time accurately. Conversely, a weak coupling limits the influence of noise, but with such a weak coupling, it is difficult to maintain the oscillations, in other words the pendulum movement." It is therefore impossible to minimize the effect of noise in the case of an hourglass clock. Autonomous clocks, on the other hand, continue to oscillate well without the need for an external driving mechanism. For these clocks, a weak coupling with the external light is enough to reset the clock in the case of large shifts in the daily rhythm, such as a trip to another continent . Consequently, autonomous clocks experience far less hinder from noise and are more robust. "We found this result both in the models we specifically developed for biological clocks of cyanobacteria as well as in a more general mathematical model for clocks," says Ten Wolde. "The reliability in the event of external noise is probably the reason that all higher organisms have an autonomous biological clock. Why hourglass clocks are still found in nature remains unclear. Although these are at a disadvantage in the case of external noise, hourglass clocks possibly offer an advantage if there is a lot of noise within the organism." Otto is not spam! Just incredibly moved and impressed.